Many corporations linked community investment with innovation. Almost six-in-ten participating companies ( 59 per cent) reported community investment activities in at least one key area of the Federal Government Innovation Plan. Education-related community projects were the most common innovation focus. In 2016, companies in the study reported 1.8M hours of employee time voluntered with an average of 31 working hours per employee. Of reported hours, 13 per cent occurred during working hours at an estimated value of $8.24M. Long-term partnerships with charities and community organizations are being leveraged, with 87 per cent of companies in the study reporting multi-year projects within their giving stratgy. "Companies within the LBG Canada network have invested more than $3 billion in community since 2007, more than $4 billion if employee and other stakeholder contributions are considered," says Stephanie Robertson, President and CEO of SiMPACT Strategy Group and Founder of LBG Canada. "The purpose of the LBG Canada program is to support community investment professionals in demonstrating the value of their work - for the community and for the business. We offer a snapshot of the information readily available to corporate Canada, in support of the goal of creating value through community investment." Both English and French copies of the report are available. 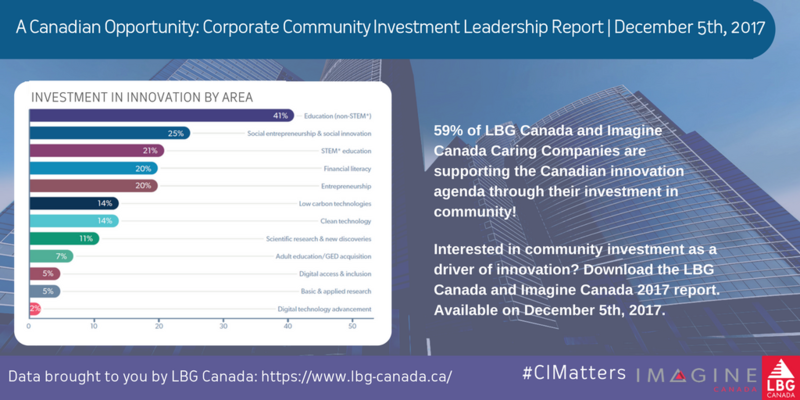 LBG Canada is a network of corporate community investment professionals from many of Canada's leading companies, who work together to apply, develop and enhance the use of the LBG Model and impact measurement framework in Canada. Participation in LBG Canada encourages companies to focus on strategy, measurement and reporting to demonstrate the business value achieved through investment in community. LBG Canada is facilitated by SiMPACT Strategy Group. Imagine Canada is a national charitable organization whose cause is Canada's charities. Our three broad goals are to amplify the sector's collective voice, create opportunities to connect and learn from each other, and build the sector's capacity to succeed. Corporate community investments are an integral part of Imagine Canada's vision for a vibrant and strong charitable sector. Imagine Canada's Caring Company designation encourages companies to adopt a leadership role as investors of 1% of pre-tax profit into stronger communities.